James Marsh's Shadow Dancer opens with scenes depicting the lead ups to a pair of violent acts separated by 20 years. The events are connected, both by the involvement of Collette (Andrea Riseborough) and by the fact that guilt created by her role as a child bystander in the first fuels her involvement as an Irish Republican Army operative in the second. Collette is not inherently violent or vengeful, but rather duty-bound in her actions against the British government, goaded on by her more militant brothers and by her lingering feeling that she owes it to her family after what happened to her as a child. Shadow Dancer is a film of deliberate pacing, a series of painstaking exercises in building tension typified by those two scenes. Largely without dialogue, Marsh stretches out these sequences, focusing on Collette's activities — as a child quietly making a beaded necklace, as an adult engaging in what at first appears to be a daily commute on the London tube — until the sense of foreboding sneaks up, and quietly grows, well past the point where we know something bad is coming. After the London incident, Collette is picked up by government agents, led by Mac (Clive Owen), who are already well aware of her reticence to engage in the violence her superiors advocate. Using that as a foot in the door, Mac offers her a choice: Spend years in prison as a domestic terrorist, with her young son forced to travel hundreds of miles from Northern Ireland to visit, or go home now and report on her brothers' activities. As Collette attempts to gather intelligence without her family discovering she's a spy, the sense of impending, growing doom Marsh uses so effectively in those opening scenes is stretched even further. She seems perpetually on the verge of being found out, and that constant tension, the question of whether this is the moment that it all falls apart, helps compensate for the deliberate pacing that may still frustrate some audiences. Marsh is probably best known for his documentary work on films like Project Nim or the Oscar-winning Man on Wire, but he reminds us here that he's a fantastic master of tone when it comes to narrative work. Shadow Dancer returns him to the territory of his portion of British television's 2009 Red Riding trilogy, with both films looking at the recent past of the U.K. through a very grim lens. But while that film's visual palette was as bleak as its subject matter, Shadow Dancer finds the director purposefully employing striking colors as a storytelling device. Consider an early scene, just before Mac and Collette meet: They are in adjoining rooms of a hotel suite. Mac is lit with the exterior light filtered to create a gauzy amber glow in the room. Collette is in a chilly, pale blue. He has an offer that could potentially be a warm salvation, but for now, she's out in the cold. Similarly, as soon as she enters the government's employ, Collette is almost always wearing something bright red, usually a raincoat of arresting crimson. It underlines the sense of dread, as it makes her a target as red as a bull's-eye, or as red as the blood that's sure to spill should Kevin (David Wilmot), the IRA official who suspects that either Collette or one of her brothers is informing, discover her communications with Mac. Marsh also likes to shoot conversations in the film in tight close-ups, with depths of field so shallow as to isolate the speakers from the blurred world around them. For lesser actors it would be an unforgiving technique. 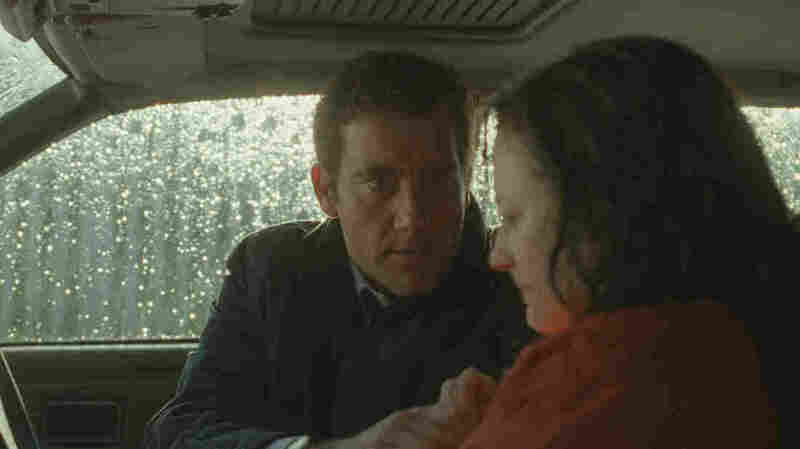 But here it highlights how brilliantly Riseborough inhabits the trapped Collette, trying to find a way out of an impossible situation, or the impotent frustration in Clive Owen's portrayal of Mac, trying to protect his source despite being frozen out of the bureaucracy back at the office.